This is what my morning breakfast usually looks like. Some food item perched on my coffee cup on the drive to work. 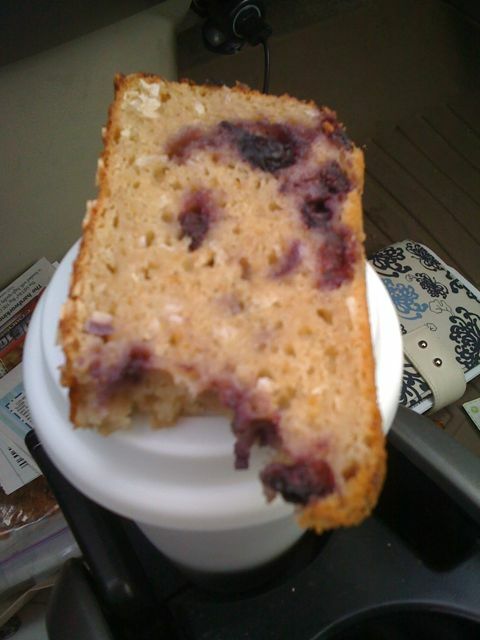 This morning it was a slice of lemon blueberry yogurt cake (via Smitten Kitchen) except I used half whole wheat flour, tossed in coconut, sprinkled almonds on top, and threw in lemon juice (because I totally misread the directions). So, basically, it’s not even the same recipe. It’s tasty, though. The lemon juice gives it a tangy brightness and the coconut adds some textural diversity.